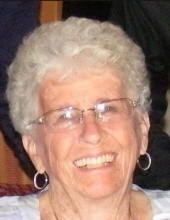 Patricia (nee Cunningham) Baer, age 88, of West Deptford passed away on September 6, 2018. Raised in Westville, Patricia graduated from Woodbury High School in 1947 and Pierce Junior College. She was a secretary for the County Superintendent of Schools in Woodbury until her children were born. After her children were grown, Patricia later worked for Strawbridge and Clothier. She also volunteered for many years for the Ronald McDonald House. Beloved mother of Colleen McKeever and her husband Bill and Patricia Britt and her husband Ken. Cherished Nana to Billy and Amy McKeever, Kyle and Matthew Britt and step-grandmother of Brian and Amanda McKeever and their daughters Ava and Brianna. Also step-grandmother of Michelle (McKeever) and Ed Frost and their children Hunter, Emily and Sean. She was predeceased by her husband Robert Baer, her parents Margaret and Frank Cunningham and brother Thomas Cunningham. Pat loved being with her family and especially when everyone gathered together for holidays, birthdays and Sunday dinners. Pat also enjoyed a good bridge game and going out to lunch and dinner with friends. In lieu of flowers donations may be made to Samaritan Health Care and Hospice via their website at www. Samaritannj.org or by mail to 5 Eves Drive, Suite 300, Marlton, NJ. To send flowers or a remembrance gift to the family of Patricia C. Baer, please visit our Tribute Store. "Email Address" would like to share the life celebration of Patricia C. Baer. Click on the "link" to go to share a favorite memory or leave a condolence message for the family.